First off, I must warn you before you read further. This guide uses both acetone and boiling water. If you can’t handle either one of these, please DO NOT attempt this. I’ve seen a lot of the same unspun Hot Wheels being sold recently. They all had one thing in common. The base was metal while the body was plastic. After seeing a post on a Facebook group today, what was going on became clear to me. This method has been around for some time but I feel it’s time it get’s out. 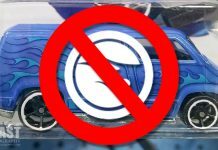 Please understand that I’m not inferring that every unspun Hot Wheels error on a plastic body is fake, but with a little bit of time and a few things from around the house, an unspun error can be easily FAKED. People seem to do whatever they can to make money in the hobby. 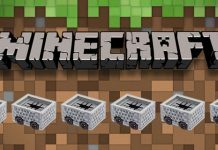 I am simply trying to bring this to light so no one gets ripped off. Hot Wheels Car – Plastic Body/Metal Base REQUIRED. Removing the car from the blister is the next step. If don’t intend on reusing the blister, just rip it open and skip this portion. This is easily accomplished using some acetone. All you need to do is apply the acetone to the back of the card, around where the blister attached. Only apply the acetone to 3 sides. You want to leave the top attached to aid in realignment when reattaching the blister to the card. Apply an ample amount of acetone to the three sides and let it sit for a minute or so. Slowly pull at the blister and remove it from the card. If done correctly, the blister will pull away leaving the card undamaged. Slide the car out. 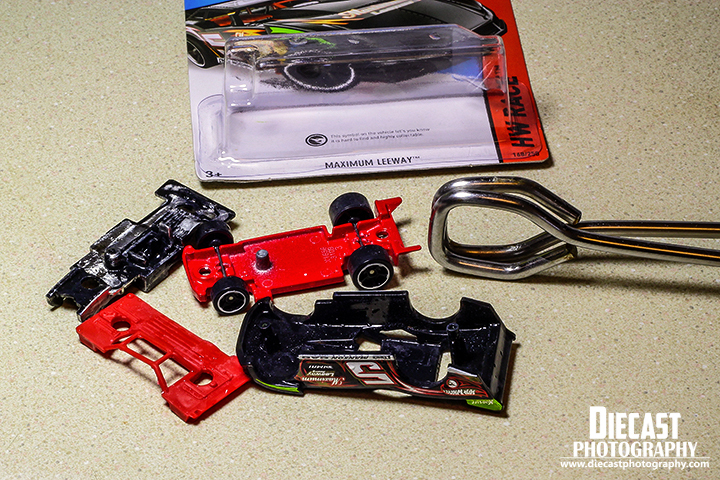 After you have released the car, now it’s time to give your soon to be unspun Hot Wheels a bath. 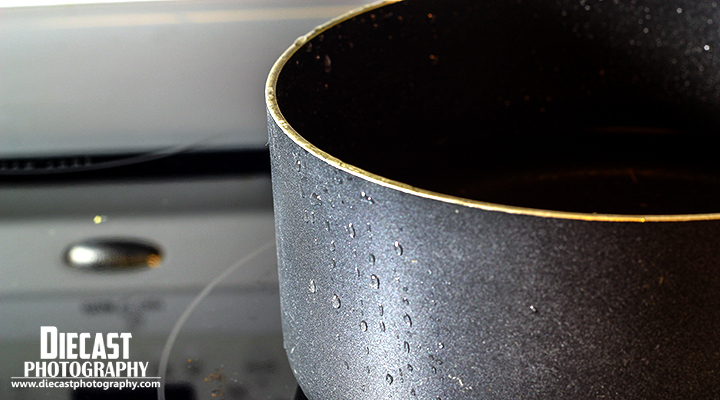 Fill up a pan with water. 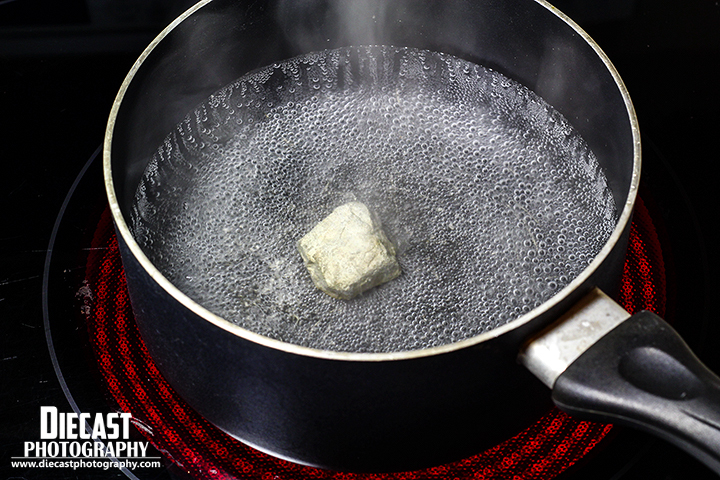 Once the water is boiling, place the casting on the rock using the tongs. Let the car boil for around 10 minutes. 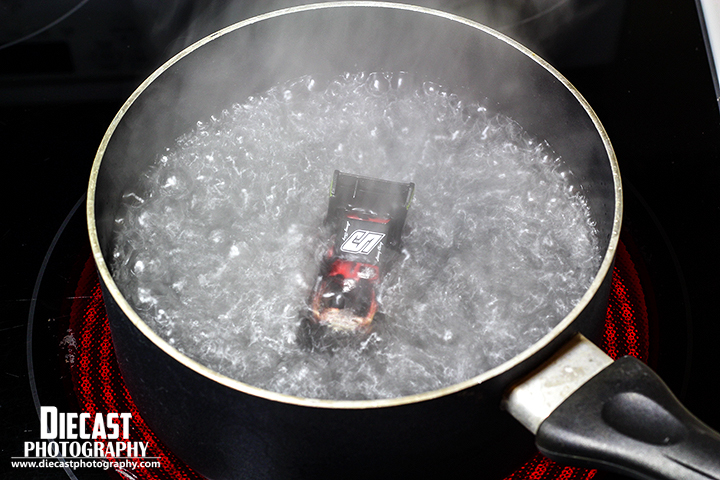 After the 10 minutes has passed, put on your gloves and remove the vehicle from the boiling water using the tongs. Holding the body in one hand, slowly pull the metal base. If done correctly, the base should release from the body easily. That’s it! You’ve just made an unspun Hot Wheels. Now all you need to do is return the unspun Hot Wheels to the package. Slide the car in whatever form you want back into the package. It can be assembled. Disassembled. Backwards. Whatever you like. Apply some glue (Elmers works fine) to the three loose side of the blister. Clamp the sides down using clothes pins or whatever other method you may have. The glue is applied white / cloudy but it dries clear. Please only use this tutorial for good, not evil. This hobby is meant to be fun. Don’t take advantage of collectors who may not know any better. Talk is cheap without proof – that’s why it’s outlined here. Too many new collectors getting burned. Exactly. We appreciate the time you took to show us. Knowledge is power, and knowing the method might make it easier to tell a fake from the real thing. Thanks! I think people just mean the ” New T-Hunt” updates, I appreciate the knowledge of fakes for people, they’ll always be out there and educating everyone is the only way it’ll ever stop or lessen. I used to love finding mess ups and at some point I was even hunting and buying all major mess ups,like no wheels or just missing the fronts,printing on wrong blisters,upside down cards w bubble stamped over the hang hook,these are worth a lot if you’ve gotten them before the stocker pokes a hole through it,punching over the hanger,window variants,unchromed or missing parts,like engines on open hoods or visible motors & major color mess ups,not color variants that are purposely done. To me these are things that are really special, I remember as a teen I found the burgundy Caravan with see through/pink tampo,the right wheels and put in the bubble facing wrong way/backwards,even in 95′ I thought there was something cool about it & I stated hunting messups before i knew what a Hunt was,I still have the Caravan MOC to this day. Last i checked it booked for $150.00, cars with no wheels to me are just amazing! how does this get by quality control? I have these and over 50 others in 4 way protector packs along side the intended versions,some with 4 diff mess ups of the same car & every single one is 100% authentic mistakes from Mattel “guaranteed!” I’d love to post pics of these things,will your site allow picture posting from our smart phone’s? No other site does or posts these things & I have tons! Please Reply if you’re interested! 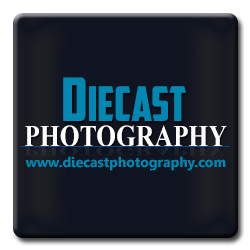 Thanks Die cast Photography ! Wow,it’s been a while for me, I’ve been collecting rare toys for 15 years and fell out of HotWheels collecting in 2006,of all my rare stuff,like Mcfarlane Variations,marvel variants and so many others nowadays,For me HotWheel collectors are the worst to deal with on ship days,you tend to know them all and only like a few,this type of collector will take a Hunt right out of your hands,throw elbows with a 11 year old and make the best collectors uncomfortable while you’re trying to be fair ,by hogging a bin,breathing over your shoulder and even jacking your fricken cart to get what you’ve found. I’ve custom painted,molded chromed spectra/ionized thousands of HW since 1999, I had a shop from 2000-2005 airbrush house of kolor cars for my regulars , back then wed use lighter fluid to seperate the bubble from card, but ive tried this on the Kool Kombi’s & it doesnt work anymore! I’d drill out the rivits then perfectly custom replicate the rivits out of body filler or sculpy,then brush paint it to match, I did wide body customs, fat fendered Fords and body dropped any and everything. I wish I could see some of the guys I did those for and the HW I did for them back then. Thanks for all the Die cast photos and T-Hunt lists,we appreciate it! KrsCustomz aka “LudeKrs” find me online and ill blow you away with custom diecast in any size! Ever wish you could have an exact replica of your actual car? 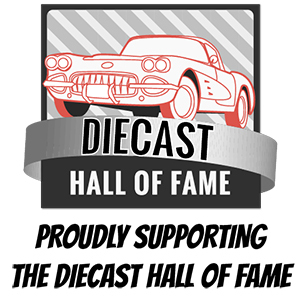 I’ve been replicating show cars, import JDM DCast & your Fathers USDM show stoppers since 1995! Like Muscle machines in all scales,Dub/Jada,Auto Art,Racing Champions & RC, in all scales,as long as the car is worth airbrushing,I don’t leave out interiors ,trunks & engine bays either,real braded hose lines,chrome&Gold leaf,marbleing,hand made scale photos,cans,dash plaques sunglasses,CD’s,stereos,I’ve been featured in Model Master mag . 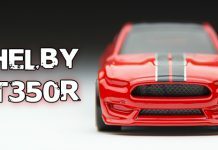 I build,sell,trade&collect hard to find plastic import Models too! I currently have over 200 full ship cases of HW most still in perfect shape with no dings,fading or warping and about 80 Hunts from various years,I need to sell it all! My son and I have even found a dozen Hunts from 2013-present,only one exception I’m keeping is my only super Hunt that my 12 year old son found at a Kroger,”Black 69Camaro w the S on the roof”(my dream car) just google and find me for all kinds of custom Art work also. Thanks! Please forgive me for the post. Nothing on eBay to show one way or another anything. Im a long time collector and started purchasing a few unspun. The. Slowly noticed that there seemed to be alot of unspun on the market. I also feel that the article and how to will do more good and maybe even slow these crooks from robbing us true collectors. I doubt that thiswill be misused as muchas some think. This artical reflects more so that hey bad guys we are on to you. You have saved me a small fortune by doing this. And i thank you. Now is there real ones out there and hkw can we tell real from fake? Do these unspun legality show up in retail blisters? If no then how does the basic collector find true collector pieces. the best way is to actually purchase them off the pegs or beware ,i believe the quality control at mattel is a little better than what we see on ebay,i started realizing this even before i found out the cars were being faked,do yourself a favor and dont purchase them, this only supports the bad habit, and in actuallity isnt the hunt and find of such a car the real treasure of the whole picture of collecting these,people want these so bad but the truth is they dont actually exist in my mind unless you find it yourself, then its real in my mind. I’ve found a couple errors on the pegs. One has the tempo messed up and a Chevy Silverado is missing the rear axel and wheels.